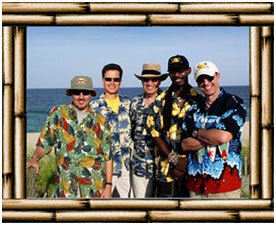 Parrotbeach is a Jimmy Buffett tribute band doing the best of Jimmy Buffett and Island music. "These guys are the hardest, working full time Buffett band on the circuit today!" The most exciting show to hit the circuit in years. Clubs, parties, fairs, festivals and major corporate events. Parrotbeach will have you singing, laughing and dancing in the streets Doing the best of Jimmy Buffet along with all your favorite island tunes. They will bring the season with them. Parrotbeach will take you back to that unforgettable island vacation. Parrotbeach will take you to a Parrotdise right here on earth.